Riddled front is the result of an advanced technological process, patented by Horm. What makes this piece truly unique is its innovative, thin wooden door, which holds the container sides thus allowing hinge-free operation. 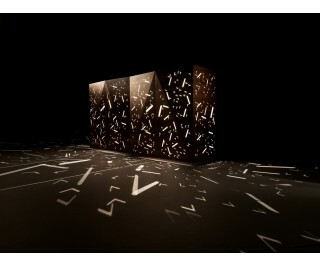 In addition, the laser-cut fretwork lets the internal light through, projecting a myriad of lights and shadows around the container. used for the door closure. Transparent tempered glass shelves, with polished edge, 5 mm thick. PVC or felt bumpers. Internal lights. Painted ABS adjustable feet with aluminium finish.